1 32 gram can Kiwi Parade Gloss Black shoe polish 2 32 gram cans of regular Kiwi Black and Neutral shoe polish 2 5.5" Kiwi 100% horsehair shoe shine brushes 2 Kiwi 100% horsehair shoe shine polish applicators 2 Shinekits flannel shine cloths Japanese carpentry intrigues us. This wood shoe shine box is a perfect example of simplicity and function for your shoe polishing needs. We've had lots of requests for Kiwi brand shoe polish from our customers in the military and other branches of service like police, paramedic and fire. Kiwi brand horse hair brushes and Kiwi brand black and Parade Gloss black polish with a can of neutral to keep on top of other shoes and boots around the house. 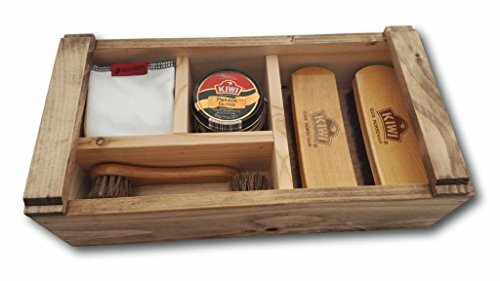 Paired with our custom made shoe shine cloths this wood shoe polishing kit is made from reclaimed pallet lumber and stained with burnt umber and dark pigments with linseed oil or a light honey stain and wax. The box measures 7 1/4" by 4 1/4" by 14". Black, Parade Gloss Black and Neutral Kiwi Polish - perfect for military and dress boots. If you have any questions about this product by Shinekits, contact us by completing and submitting the form below. If you are looking for a specif part number, please include it with your message.